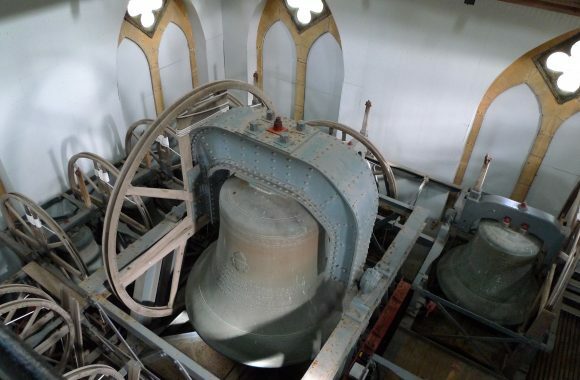 Hosanna Bell at Buckfast Abbey. Photo: Tony Stokoe. Concrete acoustic detail in the Bell Chamber, Buckfast Abbey. Photo: Tony Stokoe. Tony Stokoe, Chairman of the C20 South West Group, reports on their recent AGM. The second AGM for the South West Region kicked off a very successful visit to Buckfast Abbey on the 21 October. The AGM was a short affair, with the re-election of the majority of the committee and the confirmation of two new members, Nick Cahill and Robert Dowden. Nick recently led our very successful weekend event in Cornwall, so has already done sterling work for the region. There will be a report on the Weekend in the Cornish Riviera in the next Society Magazine. Following the AGM, Peter Beacham gave our group a talk on the history and architecture of Buckfast and its site, with an emphasis on the C20 buildings. Peter has recently completed editing a book, ‘Buckfast Abbey, History, Art and Architecture’ and was keen to share it with us. 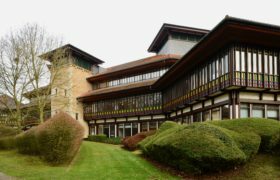 We were based in the Conference Centre, formerly the school, (Brett and Pollen 1965-8) and were all impressed by the quality of the building and the elegant octagonal refectory. There was talk amongst the committee of applying to have this very original building listed. We then ascended the Abbey tower, though did not venture onto the roof top parapet, as hurricane Brian was very evident. However the interior of the tower and Abbey roof structure were well worth the climb, the upper sections of the tower revealing the powerful concrete and steel structure behind the Romanesque exterior which was finally completed in 1938. 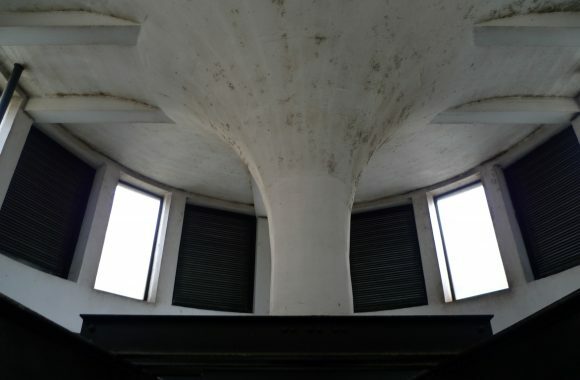 I include a photograph of the main bell chamber with the ‘Hosanna’ bell, weighing over 7 tons, and the concrete circular flume-like structure above the bells, so shaped to deflect the sound out of the space through louvres in the perimeter rotunda. All this completely hidden within the contrasting square-topped tower. After lunch on site we returned to the Abbey to view the Blessed Sacrament Chapel (Walls and Pearn 1962-6). This contains spectacular, loadbearing walls of ‘dalles-de-verre’ (literally ‘tiles of glass’) by Father Charles Norris who trained at the RCA. He did much work at the Abbey and in nearly 200 churches and is especially well represented in Plymouth. Perhaps C20 South West should organise a tour of his work in the near future?